Pope Benedict celebrated the first Mass of his Apostolic Visit to Portugal this evening in Lisbon's Terreiro do Paço. The beautiful and sacred celebration of Mass was set against the picturesque backdrop of the Atlantic Ocean. The sun was just beginning its descent as the Mass progressed with over 100 boats lining the nearby coast. An estimated 100,000 people were in attendance at the Mass where 400 priest concelebrated. Before Mass, the Mayor of Lisbon presented the Holy Father with a gift, the keys to the city of Lisbon. Opening remarks were made by Archbishop José da Cruz Policarpo, the Patriarch of Lisbon. He thanked the Pope for visiting Portugal and for "confirming us in faith" He then bestowed a gift on the Holy Father, giving him a relic of St. Vincent. The Pope also gave a gift of a Chalice to the Patriarch. In his Homily, the Holy Father spoke about the great faith and culture the Portuguese people possess. He recognized the work of Portuguese missionaries around the world. 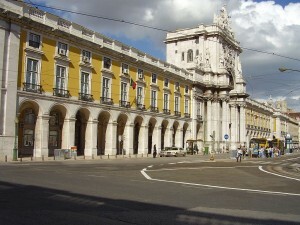 He then turned his attention to Lisbon, his first stop on his four day visit. He described the city as a shelter and port of hope for so many who had both arrived and set sail from there in the past. He said that he will use the ceremonial keys given to him by the Mayor to base the human hopes of the people of Lisbon on Divine Hope. The Pontiff also reminded the young people that the world today offers many options, but only true meaning in life and lasting joy will be found by following Jesus. Salt + Light's live coverage of the second day of Pope Benedict's trip to Portugal begins Wednesday at 12:00pm ET and will see the Holy Father in visiting the Shrine of Fatima. See programming details for all Portugal events here. Also, watch for updates on our Facebook page and Twitter.